To learn more about it, watch the video below. What can you use it for? How big is it really? What will it accommodate? Do you need to adjust cooking times due to size and wattage? 7 minutes of informative content, no chitchat. 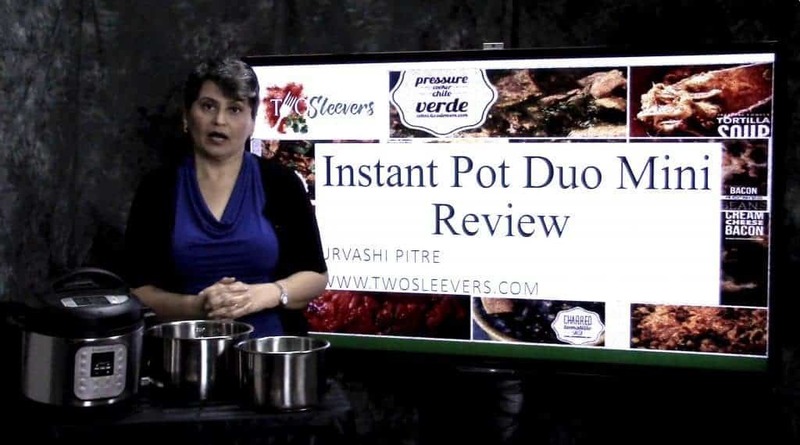 I would love to hear what you think of both the review as well as the Instant Pot Mini if you have one. This review, test, and recording took me about 5-6 hours to do. If you do buy it, I hope you’ll consider using my affiliate link on Amazon for it. I hope this review of the Instant Pot Mini answers most of your questions, but if not, do let me know and we can see about adding new content or at least answering your questions. Thanks for all the info. I don’t have one yet, but am planning to buy. Is it possible, in the 3 qt mini, to cook 2 cups of dry beans, with the 4 cups of liquid being one-half water, and one-half tomato sauce or canned diced tomato with tomato juice? Yes it is. Safer with canned tomato and tomato juice than sauce I think. Thank you! One more question: do you think the dry (un-presoaked) beans will soften up adequately in a pressure cooker when cooked with tomato? On the stove top, I’ve always waited until after they’ve softened before adding anything acidic. I’m assuming you think the canned tomato and tomato juice would be the better way to go, rather that sauce, because it is more watery? My biggest motivation in buying an instapot is to hopefully make more flavorful beans (avoiding salt and oil for medical reasons), and I’ve read that under pressure, cooking with tomato can add a lot of flavor “cooked into” the beans. I have a 6 quart and my mom recently got the 3 quart. Hers seems to take a lot longer to cook the same foods than my does. Is this normal? Does the mini take longer? 10% less wattage is yes. It’s possible. Urvashi, its 30% less wattage, all 6Q models are 1000 watts, the mini’s are all 700 watts. and it depends on the amout of food they are putting in, if they are stuffing her 3Q almost full and using the same recipe amount in the 6Q taking up only half the volume, that may be one of the reasons. Good point in the volume as well. Fantastic, efficient, yet thorough review. Very helpful. Thank you! Hello! I really appreciated your review and can not wait to purchase the instant pot and your cookbook. Yum! But quick question – you mention using an additional pot inside of the stainless steel insert to cook different items at the same time. How does that work, and can you please post a link to the exact “accessory” items that you use with this model? The reason I had not already bought a pressure cooker was because I didn’t think I could both cook chicken and steam rice at the same time – but it sounds to me that you’re saying this IS possible? I would love more information on that. Thank you so much! My only problem is how to convince my husband that I NEED another instant pot since I already have three. I do use them every day. I too remember my mother using her pressure cooker. She used the open pan forever. I have read that after World WarII inferior material was used in some pressure cookers and that was why so many failed. Which 3 and why so nany please? Thank You for one of the best “review” / “how to” video’s I’ve seen in a very long time! Straight forward, to the point, easy to listen to. Much appreciated! And the best review on the mini I’ve seen yet. Keep up the good work! Thank you for the very well made and to the point video. You mention in the video that the mini can handle 2lbs of meat. I am torn between the mini and the 6qt. I cook for two and usually make a meal that will last for two days (IE four boneless/skinless chicken breasts) which is roughly 1.4kilos (according to the package im looking)…that’s roughly 3 lbs… Would this fit and cook in the 3 qt? I’m not certain if the boneless/skinless would make a difference, or even if 2lbs is the max the 3qt can handle. I like the smaller footprint of the mini.. It can easily handle 4 boneless chicken breasts I think. I’d look at a 3 quart casserole you have at home to get an idea but I’m quite sure it will hold that. I cook for two and use it all the time. Not really, because not all the 6 quart recipes fill the whole pot. You have to look at the quantity of the main ingredient and see if that much meat or beans or rice or whatever will fit. Is there a cookbook exclusively for the mini? There isn’t but you don’t need one either really. All of my recipes work in one except for maybe the Pot in pot ones. I had a 6 qt and is now damaged. I was thinking of the 3 qt as a replacement as there’s only 2 of us. How do I know when the 6 qt recipes won’t work in my 3 qt in terms of quantity? If it is too much, do I just halve everything? But there has to be at least 1 cup of liquid, if I halve everything, there may not be enough liquid? How do I adjust? How do I know? Thx. Did you watch my review of the mini video? That will answer most of these. Thank you for your review! 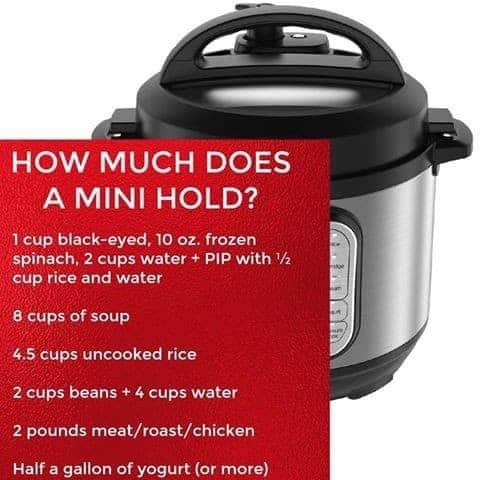 I was trying to decide whether to buy a mini as an adjunct to my 6 qt., but I see I could actually make good use of it for main dishes as well. My whole family loves Indian food, so I am looking forward to following you and checking out your book! Excellent review! Thank you! You helped me decide on the 3qt over the 6 qt (I already have a Wolfgang Puck 8 qt). I also just bought the Kindle version of your Indian cookbook as well. Can’t wait to try the recipes once my mini comes in two days. I made sure to order using your url. ???? Aww thank you for using the URL. So thoughtful. I do love my mini. I can’t wait to see what you make with the recipes! Hello there and thank you for such a wonderful video! Ps, I love the font in the response box! You’re welcome! I haven’t yet seen replacement rings. I’m hoping they’ll come up with them soon. I have been enjoying your videos, I am not a total newbie to pressure cooking, but am to electric pressure cooking, on of my fondest childhood memories is of my mother standing on a kitchen stool scraping lima beans off the ceiling when the valve blew on her manual pot, and cursing. She never did stop using her old Mirro pot, and I think she would have loved my Instant Pot Mini. You wonderful review had sold me. I was torn between the 6 quart and the mini. We are fast becoming empty nesters and your review convinced me to go with the mini. I’m confident it will do everything we need. I can’t wait to try your butter chicken recipe. Oh I love hearing that! Those videos take a while to make and I always wonder if they help. ???? Thank you for letting me know. You wonderful review had sold me. I was torn between the 6 at and the mini. We are fast becoming empty nesters and your review convinced me to go with the mini. I’m confident it will do everything we need. I can’t wait to try your butter chicken recipe. Yes absolutely. Poultry was just a 20-minute preset is all. You can cook any kind of meat in a pressure cooker. Thanks for the review. I have the instant pot DUO 6 quart. You mentioned that the mini doesn’t “self seal”. I don’t know what that is. Could you explain please. Thank you. The Ultra when closed automatically turns the valve to sealing so go don’t have to move it from venting to sealing. It is the only one so far that does that. The mini, duo, and Lux all require you to move the valve to sealing. That’s what I was referring to. The Instant pot website has a 2-pack in clear sealing rings for the 3 qt MINI, unfortunately they are both clear, I would prefer them in different colors to make it easier to to keep track. This is the 2 pack with different colors! I ordered those for my mini! The colored ones. Blue for desserts and red for spicy food like taco meat etc. The clear for everything else western and more non ethnic cooking. I also ordered a ceramic lined pot for it to do just milk an other desserts. You can go into resources, choose a topic and click and then you will have different things they have for that particular product and accessories.